“al-waqaaljadeed.cm” Fri, April 05, 2019/ Private. 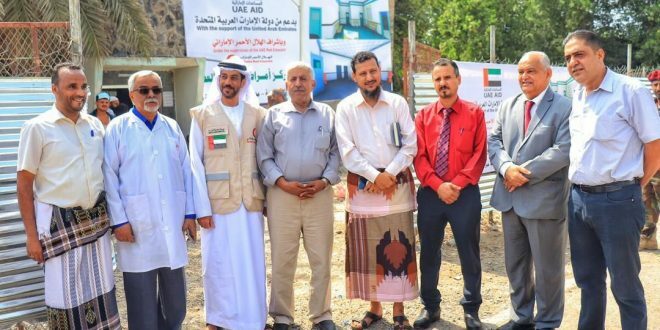 The United Arab Emirates, represented by the Red Crescent Authority, has begun the rehabilitation project of the Center for Orthopedic and Joint Diseases at Al-Gomhouria Teaching Hospital in Aden. During the inauguration of the project, Dr. Nasser Baoum, Yemeni Minister of Health, accompanied by Mohammed Al Shehhi, representative of the Red Crescent Authority, said that this specialized orthopedic facility in Aden will serve patients from the population of Aden and other Yemeni governorates, especially war-wounded. For his part, Dr. Ahmed Salem Al-Jarbaa, Director of Al-Gomhouria Educational Hospital, praised the start of work in the orthopedic surgery center with the support of the UAE. Explaining that the work will include the rehabilitation of the center of orthopedic surgery, both “men and women” will be built rooms for operations and accessories. “We are in dire need of establishing specialized clinics and centers to pay for improved medical services provided by the hospital,” he said. The director of the hospital praised the UAE Red Crescent team which has been exerting great efforts to support Al-Gomhuria Hospital since 2015 by rehabilitating its departments and supplying it with medical equipment and equipment. The most recent was the renovation of the outpatient clinics which have been parked for years.